When you sit down to eat these cookies, please make sure that you have a tall glass of milk to go with it. The experience will be totally blissful. Preheat oven to 175º C.
Add the eggs, peanut butter, corn syrup, and vanilla extract and beat well. Add the oats, baking soda, and salt and stir well. Using an ice cream scoop, scoop out batter onto the cookie sheets, leaving some space between them. Flatten them out a little. Bake for 12-15 minutes. The center of the cookies will be slightly soft. Note: I halved the recipe and got about 20 cookies. 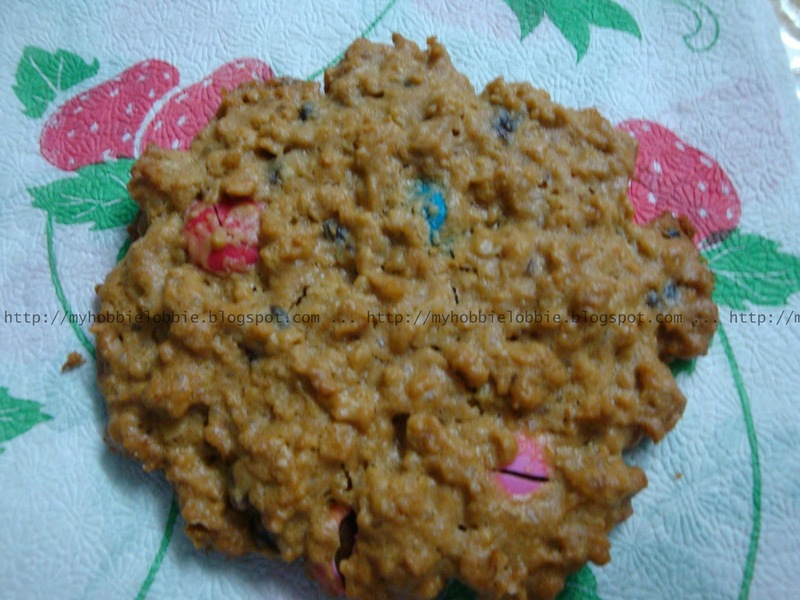 Monster cookies are a classic. Thanks for linking these up to Sweets for a Saturday. Always a pleasure Lisa ... Thanks for hosting! Awesome looking cookies! thanks for the visit! I love monster cookies. My sons asks for them by name, in his best monster voice. How adorable! These are right up there on my favorite cookies list!! !